Tuesday January 15, 2019: Oscar learns how long he may have left, Alexis urges Julian to go to Kim, and Aiden opens up to Franco . In Anna’s room at GH, her eyes are bandaged after a laser procedure and Finn is by her side. Chase arrives, and Anna suggests he take his hovering brother for some coffee. They leave, and Anna asks Griffin about the damage to her eyes. Griffin reveals the surgery went well, and later he brings Finn back in to be with Anna as the bandages are removed. After he takes them off Anna cries tears of joy because she can see. Griffin looks over her tests results and finds some odd markers. Finn reviews them reveals the virus that caused her to go blind is one he’s never seen in North America. She asks how she got it, but he doesn’t know. Joss finds Cam asleep in the hospital chapel with a drug recovery pamphlet. She wakes him and asks if he’s doing drugs. He comes clean about the weed purchase, and she is touched at what he did for Oscar. Cam is just glad Oscar is feeling better. Joss realizes Cam still doesn’t know and tells him that Oscar is dying. Cam’s phone buzzes and he figures he has to get home or his mom will kill him. He says he’ll text her later and is there for her and Oscar. In Kim’s office, Kim tells Terry that she and Drew want to be open and honest with Oscar about what is to come. Meanwhile, Oscar runs into Alexis in the hallway and asks her to finish up his will so everything will be taken care of. He will contact her later but has to get to a meeting. Oscar joins his mom and Terry in her office, and Oscar asks what it will be like when he’s dying. Terry explains the pain will become more severe, and symptoms vary from patient to patient, but gives him an idea of what he may experience. Oscar asks about how much time he has. Terry says she’s seen patients with his prognosis last seven to eight months, but also go as early as six weeks. Kim hugs her son, and later gives him the journal of things he and Joss planned do together. She promises to help him cross off as may things on the list. She urges him to go be with Joss, so he leaves. Monica checks on Kim, who admits she doesn’t know how to let go of her son. Oscar finds Joss in the chapel and they look through their book and decide what to do first. 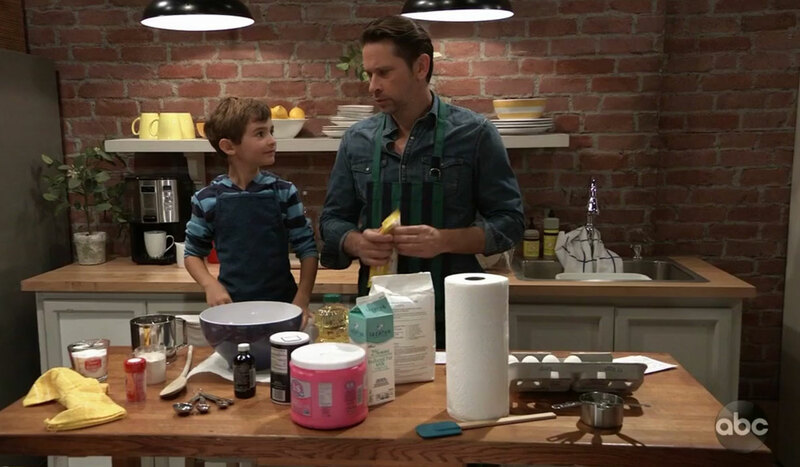 At Liz’s, Franco offers to help Aiden bake cookies for the school bake sale while Liz goes to a meeting. They get to work and Franco is impressed by Aiden’s cooking skills and he asks why he didn’t tell them that he likes baking so much. Aiden admits he didn’t want to be laughed at again. Willow walks into Charlie’s. Julian wonders if she’s thought about leaving town and starting over elsewhere. Willow says moving won’t make her forget her son. Liz arrives to meet Willow, and they speak about how Aiden is doing. He is still isolating himself, but Willow is monitoring things and this situation will eventually pass. Liz just wants her son to be happy. Liz takes off and gets a text from Franco to buy something that surprises her. Alexis enters and orders Julian to put aside his misguided priorities and go to Kim. Julian realizes the drug trial didn’t work and Oscar is dying. Julian thinks Kim has Drew, but Alexis says she needs him. Meanwhile, Michael stops in and speaks with Willow. He hasn’t seen her at the bereavement meetings lately and assumes she has found some peace with her situation. Outside, Julian runs into Kim, and tells her how sorry he is about Oscar. He invites her in. Julian treats Kim to some hot chocolate and she thinks perhaps just enjoying the moment and not thinking about the future is the secret to get through what is coming. Chase arrives and meets Willow and they leave for a date as Michael watches. Jordan urges Maxie to cancel Lucy’s book event before it becomes a crime scene. Peter suggests Lulu find someone who will talk to her if the PCPD won’t. Ava tells Scott that he won’t be seeing her around much anymore. Laure tells Ryan that she has to decline his request.